Franchising is a business with training wheels. The trail has been blazed. The blueprint is handed to you with all the elements in place: branding, marketing, website, apps, processes, products, systems, etc. However, with 4,000 franchises that span more than 90 industries under the franchise umbrella, how do you figure out which is best? Unfortunately, it's a bit overwhelming. There is a lot of info out there on how to buy a franchise. But there is no short cut for due diligence. So, what is the best way to find that one, perfect concept for you, your family's future and for your market? At The Franchise Academy powered by FranChoice, helping people find their ideal franchise opportunity is what we've been doing for almost two decades. As a result, we have worked with thousands of people looking to find the right franchise and realize their dreams. 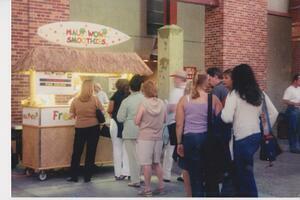 I actually used FranChoice to find my first franchise, Maui Wowi Smoothies. I ended up as the #1 producer in that franchise because I was so well matched based on my skills and personality, not by what I thought I'd like to do. My second franchise failed. I believed that I was an expert at picking franchises and I thought I could do it on my own. Obviously, there was a lot I didn’t know before I made the investments and that’s why I’m writing about this subject for you. The silver lining is that the failure did make me an expert and since 2005, I have been advising people who are considering investing in a franchise. When I was buying my first franchise, I found using a reputable Franchise Consultant (one who has "CFE" after their name) to be very helpful. You do not need a franchise consultant to buy a franchise but why risk it if the service is free? If you are sure that you want to investigate franchising because you see how business ownership can get you to your goals, where do you start? Before you start looking at franchises, take stock of that most important component of the equation – YOU. Consider your past jobs and determine what you liked best and least about them; then make a list of your strengths and weaknesses. How much money can you invest and how much would you like to make? Are you comfortable managing others or would you prefer to work alone? Where do you want to work? Are you willing to relocate? What hours are you willing to work while the business ramps up and what lifestyle expectations do you have after the business is established? How do you feel about selling and the sales process? By starting with a list of what you have to offer and what you need from a business, you can create a strategy and model for your research. Keep an open mind. Whether you use a resource like me or do your own franchise research via the Internet, it is best to keep all options open when considering a franchise. An inexperienced person may approach the process by thinking, “Well, I love donuts. How about a donut franchise?” And after spending days or weeks of research on Krispy Kreme, Dunkin’ Donuts and others, the individual may find he doesn’t have the required capital, the territory he wants is not available, and he’d have to give up weekends if owning a food franchise. Another ineffective way to begin your franchise research is to lock yourself in to one or two concepts. If you think, “I’ll only look at ice cream and exercise franchises,” you may miss finding that that gem of a concept that would mesh perfectly with your needs. With thousands of franchise companies available, keeping an open mind is the best strategy you can employ to get on the ground floor of that new, hot concept or to find something that will really take off in your market. Let’s say you’ve found an assortment of franchises that look promising. What do you do next? Contact the franchisors and request information about their concepts. You will probably get call from someone in the franchise development department who will gauge your interest and advise you if the territory you seek is available. You will want to thoroughly view the web site information and any brochures and videos they send you. Keep notes on your impressions. Are their materials professional and up-to-date? Are you treated courteously by a friendly and knowledgeable member of the corporate office? Are your questions and concerns answered to your satisfaction? What you see from the company at this time may be an indication of the type of support you would receive as a franchisee in their system. Your next step is to read the company’s FDD (Franchise Disclosure Document), a document every franchise in the United States is required to provide. From this you will learn the history of the company, the training and marketing programs, and what costs, royalties and fees you will be required to pay. Some franchisors also provide earnings claims in the FDD that will help you estimate the potential of the business. The FDD is full of information about the franchise and it clearly explains the responsibilities of the franchisee (you) and the franchisor. Your FDD review and understanding is a very significant part of the research process. By paying attention to what you discover in a company’s FDD, you can weed out franchises that just don’t measure up. Some warning signs of a franchise that is facing challenges are extensive litigation with franchisees or a closing rate of units greater than what’s being opened. Here is a short overview of the The Franchise Disclosure Document. We consider this step to be of monumental importance when judging the likelihood of finding happiness in a particular franchise: CALL EXISTING FRANCHISEES! Existing franchisees are your best source of information for finding out what really happens in a business on a day-to-day basis. You can ask what they like and dislike about the business, if they are happy with corporate support, and even get a feel for the type of earnings a franchise makes. Gather a variety of opinions and you’ll get a clear picture of not only the franchise itself but of how you’d fit into the organization. That is why this step is so significant to your being able to make a definitive decision. Hopefully you’ve now found one or more companies that will meet your needs. When you’ve made it this far, it’s time to go to Discovery Day (an on-site meeting with a franchisor). At this meeting you will be introduced to the top people in the home office and you may make a visit to a local franchisee, allowing you to ask even more questions and maybe to get some hands-on experience with the business. Discovery Days are very interesting and exciting. When you leave, you will have a good understanding of the franchise. Don’t forget that this is a two-way street. They’ll be evaluating you as thoroughly as you evaluate their business. The last step, of course, is making the final decision. Like any major decision, you will be filled with anticipation and anxiety, excitement and fear. Those are very normal feelings, experienced by almost everyone. But if you’ve done your homework and followed the steps as outlined, you should be very comfortable with your decision. Congratulations – you’re ready to be a franchisee! Buying any franchise is a big investment, not just financially but also of your time. I’d hate to see you make an expensive mistake, so let’s talk before you make your move. I offer a free 15-minute call to pick my brain. No obligation to buy anything. I am here to help and serve. Read about how I made the change from employee to employer: I Gave Up A Pension for This?